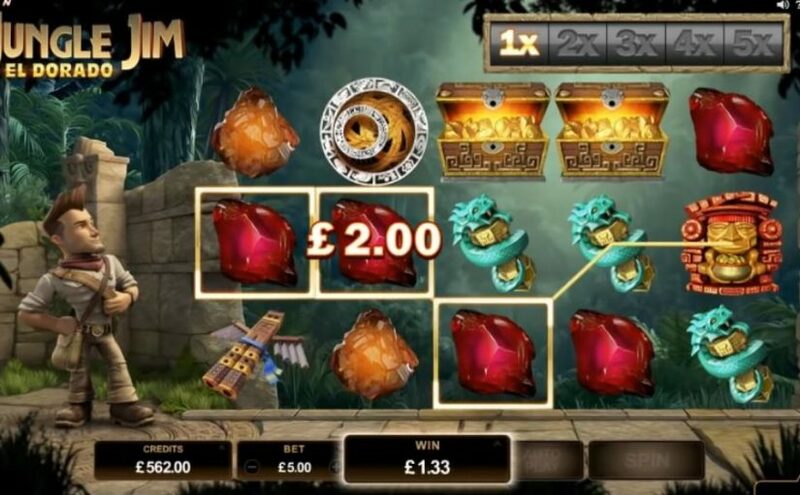 Jungle Jim El Dorado is an innovative 25-line slot powered by Microgaming, which takes players deep into the heart of the jungle in search of El Dorado, the legendary city of gold. Armed with his bag of high-tech gadgets, Jim never turns down the challenge of a great treasure hunt, especially when it involves Rolling Reels, where all winning symbols explode on screen and a new set of symbols drop down, giving multiple opportunities to win. When three scatters land on the reels, 10 free spins are unlocked. The game’s multiplier trail brings added excitement, where the multiplier increases with each consecutive win, building up to 5x in the base game and an incredible 15x in free spins. The Free Spins can be re-triggered.